Text Pendulum Effect: Unless you have a "Performapal" card in your other Pendulum Zone, this card's Pendulum Scale becomes 4. 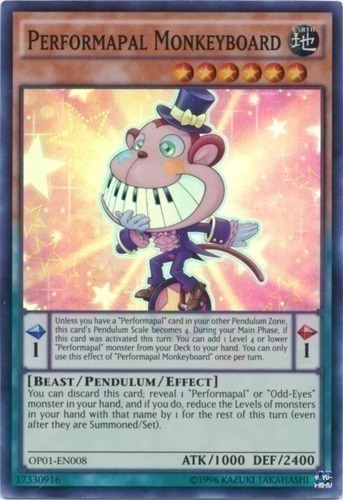 During your Main Phase, if this card was activated this turn: You can add 1 Level 4 or lower "Performapal" monster from your Deck to your hand. You can only use this effect of "Performapal Monkeyboard" once per turn. Monster Effect: You can discard this card; reveal 1 "Performapal" or "Odd-Eyes" monster in your hand, and if you do, reduce the Levels of monsters in your hand with that name by 1 for the rest of this turn (even after they are Summoned/Set).